Obituary – Thomas, David Sleeth « Perry High School Alumni Association, Inc.
﻿- age 16, son of Rev. and Mrs. David Thomas of Perry, was born June 10, 1924, in Perry, and has attended schools here for 11 years. David is president of the student council, as well as being president of the senior graduating class. He is a member of troop 15, Boy Scouts of America, and appeared in both the junior and senior class plays. He also has taken part in the band and in the mixed chorus. A member of the National Honor Society, David plans to attend Park college after graduation here. Photography and stamp collecting are his favorite hobbies. Sgt. David S. Thomas was killed in action in Germany on March 25, 1945. Sergeant Thomas was wounded slightly in Holland October 26, but had since returned to duty with an infantry outfit. He recently had been promoted to sergeant from private first class. Thomas was an outstanding student during his school days at Perry high school, from which he was graduated in 1941, and was president of the student council and the National Honor society during his senior year. He was a Daily Journal carrier-salesman for several years. He won a place in the army’s student training program following induction into the army and studied at Rutgers university, Rutgers N. J. until the training program was abolished, then he was assigned to Camp Carson, Colo. He was formerly a student at Park college, Parkville, Mo. Thomas holds the Purple Heart for his wound in Holland and the combat infantryman’s badge “for exemplary conduct in action against the enemy.” He was cited February 9 in recognition of outstanding performance of military duty in Germany on November 23, 1944. A brother, Harcourt Thomas is an army aviation cadet. David Sleeth Thomas, Sergeant, U.S. Army. Home address: Perry, Noble County. Reverend and Mrs. David Thomas, Parents, 917 West, Stillwater. Born June 10, 1924. Enlisted May 25, 1943. Decorations. Order of the Purple Heart twice, the last one awarded posthumously; Combat Infantry Badge; Citation of Honor; Silver Star, posthumously awarded. Member of the Presbyterian Church, Perry. 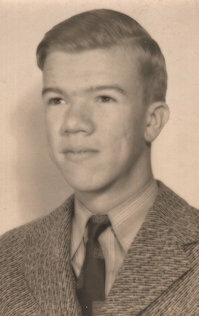 Graduated from Perry High School, 1941, where he served as President of the Student Council, and as President of the Honor Society during his senior year. Attended Park College, Parkville, Missouri, and Oklahoma A & M., Stillwater. ﻿Served with the “Timber Wolves”, 104th. Infantry Division, 413th Regiment. 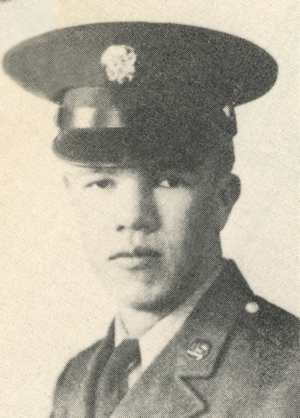 The citation with the Silver Star read in part: “Skillfully maneuvering his squad in advance to relieve a besieged platoon, Sergeant Thomas exposed himself to enemy fire to lead his men forward. Reaching a point 25 yards from an enemy machine gun, he coolly raised himself to an upright position, shot two enemy soldiers and rushed the enemy positions. In the fierce fire-fight that followed Sergeant Thomas was mortally wounded, but his men, inspired by the gallantry of their leader, captured the objective.” Died March 25, 1945, in action in the vicinity of Asbach, Germany.